The definition of bus advertising is advertising displays placed inside and outside of city buses, which include partial and full wraps. City bus advertisements and ad on bus options are available in almost every market across India. Bus wrap cost is greatly reduced when compared to other advertising services, such as television, internet and radio. In fact, many advertisers give their first preference for bus advertising or bus shelter advertising as compare to other media option. Bus shelter ad also called as bus station advertising or bus stand advertising, it is the least costly of all researched media formats. Bus advertising is effective mode of advertising, Due to the great visibility and low public bus ads costs to advertise on buses. Bus stop advertising helps to reach drivers and pedestrians in a cost-effective way. Bus stop ads are available in almost each city across the country and are a great supplement to almost any other format. Statistics show that posting an advertisement on bus displays on the outside and inside of city buses or on bus shelter advertising displays produces high impressions at a low cost. Similarly, double decker bus advertising is a great way to increase exposure of an ad campaign using sightseeing tour bus advertisements. Bus advertising is a great medium of visibility for your brand. It is a cost effective medium to promote your brand and spread awareness. Bus stop advertising in India where every metro-semi metro- urban city has the huge number of buses, in urban area people are depend on the city buses for their daily transportation. Buses circulating in the busiest areas of major metropolitan cities, bus advertising offers exposure to local commuters, drivers and pedestrians. Thanks to traffic jams, a modern customer spend as much time, if not more, in their cars as they do watching television or reading newspapers or browsing the web. This makes bus advertising the most effective medium to reach potential clients. Bus shelter and bus advertising includes full bus wrapping service, Bus Back Panel Advertising, Bus Side Panel Advertising, Bus window advertising etc. BENEFITS OF BUS ADVERTISING: Bus advertising offers high-frequency. Bus advertising yields targeted and focused coverage. Bus advertising is extremely cost-effective media avenue. Bus advertising offers ideal synergy for radio. Bus advertising is Ideal for short-term and promotional campaigns. Buses are moving throughout residential and core business areas and on busy streets, every day. Bus advertising delivers quick bursts of essential information throughout the marketplace and is seen by both pedestrians and vehicular traffic at the same time. Bus Advertising is available in a variety of sizes and formats, ranging from side panel displays to fully wrapped buses. Some other benefits of bus advertisements are low cost outdoor advertising with a highest possible reach. Bus advertisements act as an excellent advertising technique. Bus advertising provides advertising which provides High-visibility, High-impact and High-frequency. Bus advertising offer 24-hour clear visibility and read ability provides a high-impact medium. Bus advertisements offer unlimited creative concept and flexibility. Bus shelters which is situated near shopping centres offer point of sale position. Bus advertising offers street presence and local public reach. Bus advertising has many benefits to offer. Which will helps to fuel your business and bring more customers. Bus shelter advertising`s target locations are Supermarket, Primary school, High school, Seasonal and coastal regions, Upper community location. Bus shelter advertising is located along busy streets in major metropolitan cities. Benches provide excellent exposure to pedestrian and vehicular traffic. Bus advertising is act as an effective medium for point-of-purchase, ethnic or geographic marketing. Bus advertising offers exposure to local commuters, drivers and pedestrians. It acts as an moving billboard`s, which is typically displayed on the bus exterior and come in a variety of sizes and high-impact formats to reach your audience. Bus advertising is available in various sizes and formats, from side panel displays to fully wrapped buses. Bus advertising even can be used for target specific demographics based on route and deliver exposure where other out-of-home advertising may be prohibited. Bus shelter are strategically located along busy streets in major metropolitan cities, Bus advertising provide excellent exposure to pedestrian and vehicular traffic. Bus Shelters advertising give consumers something to look at while they’re waiting for the bus, making them particularly effective for advertising point-of-purchase and directional information. There are different types of Bus advertising, which are: Bus shelter advertisement has an option of either illuminated or non-illuminated advertisements as per the need and budget. Bus advertising is suitable where large formats are prohibited. It proves highly cost - effective. Bus advertising offers wide area coverage. Bus advertising is cost effective. Bus advertising available in two varieties: non-illuminated bus shelter and illuminated bus shelter. Bus advertising is offer eye level visibility. Bus advertising is eye catching and easy to read. Bus advertising has Excellent Reach ability. Bus advertising is suitable for metropolitan and affluent residential localities, Bus advertising stands out prominently. Advertising on buses is effective mode of advertising, Due to the great visibility and low public bus ads costs to advertise on buses. The definition of Advertising on buses is advertising displays placed inside and outside of city buses, which include partial and full wraps. City Advertising on busess and ad on bus options are available in almost every market across India. Bus shelter ad also called as bus station advertising or bus stand advertising, it is the least costly of all researched media formats. Bus stop advertising helps to reach drivers and pedestrians in a cost-effective way. Bus stop ads are available in almost each city across the country and are a great supplement to almost any other format. Statistics show that posting an advertisement on bus displays on the outside and inside of city buses or on bus shelter advertising displays produces high impressions at a low cost. Similarly, double decker Advertising on buses is a great way to increase exposure of an ad campaign using sightseeing tour Advertising on busess. Advertising on buses is a great medium of visibility for your brand. It is a cost effective medium to promote your brand and spread awareness. Bus stop advertising in India where every metro-semi metro- urban city has the huge number of buses, in urban area people are depend on the city buses for their daily transportation. Buses circulating in the busiest areas of major metropolitan cities, Advertising on buses offers exposure to local commuters, drivers and pedestrians. Thanks to traffic jams, a modern customer spend as much time, if not more, in their cars as they do watching television or reading newspapers or browsing the web. This makes Advertising on buses the most effective medium to reach potential clients. Bus shelter and Advertising on buses includes full bus wrapping service, Bus Back Panel Advertising, Bus Side Panel Advertising, Bus window advertising etc. BENEFITS OF ADVERTISING ON BUSES: Advertising on buses offers high-frequency. Advertising on buses yields targeted and focused coverage. Advertising on buses is extremely cost-effective media avenue. Advertising on buses offers ideal synergy for radio. Advertising on buses is Ideal for short-term and promotional campaigns. Buses are moving throughout residential and core business areas and on busy streets, every day. Advertising on buses delivers quick bursts of essential information throughout the marketplace and is seen by both pedestrians and vehicular traffic at the same time. Advertising on buses is available in a variety of sizes and formats, ranging from side panel displays to fully wrapped buses. Some other benefits of Advertising on busess are low cost outdoor advertising with a highest possible reach. Advertising on busess act as an excellent advertising technique. Advertising on buses provides advertising which provides High-visibility, High-impact and High-frequency. Advertising on buses offer 24-hour clear visibility and read ability provides a high-impact medium. Advertising on busess offer unlimited creative concept and flexibility. Bus shelters which is situated near shopping centres offer point of sale position. Advertising on buses offers street presence and local public reach. Advertising on buses has many benefits to offer. Which will helps to fuel your business and bring more customers. Bus shelter advertising`s target locations are Supermarket, Primary school, High school, Seasonal and coastal regions, Upper community location. Bus shelter advertising is located along busy streets in major metropolitan cities. Benches provide excellent exposure to pedestrian and vehicular traffic. Advertising on buses is act as an effective medium for point-of-purchase, ethnic or geographic marketing. Advertising on buses offers exposure to local commuters, drivers and pedestrians. It acts as an moving billboard`s, which is typically displayed on the bus exterior and come in a variety of sizes and high-impact formats to reach your audience. Advertising on buses is available in various sizes and formats, from side panel displays to fully wrapped buses. Advertising on buses even can be used for target specific demographics based on route and deliver exposure where other out-of-home advertising may be prohibited. Bus shelter are strategically located along busy streets in major metropolitan cities, Advertising on buses provide excellent exposure to pedestrian and vehicular traffic. Bus Shelters advertising give consumers something to look at while they’re waiting for the bus, making them particularly effective for advertising point-of-purchase and directional information. There are different types of Advertising on buses, which are: Bus shelter advertisement has an option of either illuminated or non-illuminated advertisements as per the need and budget. Advertising on buses is suitable where large formats are prohibited. It proves highly cost - effective. Advertising on buses offers wide area coverage. Advertising on buses is cost effective. Advertising on buses available in two varieties: non-illuminated bus shelter and illuminated bus shelter. Advertising on buses is offer eye level visibility. Advertising on buses is eye catching and easy to read. Advertising on buses has Excellent Reach ability. Advertising on buses is suitable for metropolitan and affluent residential localities, Advertising on buses stands out prominently. Cost of advertising on buses in India is greatly reduced when compared to other advertising services, such as television, internet and radio. In fact, many advertisers give their first preference for bus advertising or bus shelter advertising as compare to other media option. Bus advertisement is the easiest, fastest and most effective way to reach out to lakhs of consumers. Bus advertising is also known as metro rail advertising or rail advertising. Bus advertising is a perfect way to attract the attention of commuters who travel by trains on daily basis across city. We do Bus advertising in PAN India to get the highest visibility to your brand. Cost of advertising on buses in India helps to focused exposure at a single point. Bus advertising price creates excellent visibility to your brand. Bus advertising helps to reach wider ability to a large spectrum of audience. Bus advertising covers long and wide distance. Why you should select bus advertising over other advertising options? Cost of advertising on buses in India is cost effective and it is a medium to reach maximum audiences, where bus advertising campaigns specialize in attracting consumers on the move, especially the otherwise hard-to-reach commuters and members of targeted communities. Bus advertising helps to reach masses. Mumbai local trains are the lifeline of the city and it carry approximately 2 million passengers on the Western, Central and Harbour line in a day. Due to this advertising on local train is highly in demand. Bus advertising price provides a highly personalized local touch to local audiences. Highly visible these attractive displays at bus stop station throughout the length and breadth of Mumbai city across the Central, Western and Harbour are designed brilliantly to grab the attention of lakhs of travelers. Regular commuters just cannot avoid seeing these advertisings displayed at strategic locations at the bus station or bus shelter. Bus advertising offers a wide variety of campaigns suiting your needs and to serve your purpose. Smart Ads is the first choice for all bus advertising campaigns. We provide all types of bus advertising solutions to our clients with PAN India visibility. Call now, to get the lowest rates for your location. Cost of advertising on buses in India is cost effective as compare to other mode of advertising. It is the best medium to promote your brand and spread awareness. Bus shelter advertising where every metro-semi metro- urban city has the huge number of buses, in urban area people is depending on the city buses for their daily transportation. Buses circulating in the busiest areas of major metropolitan cities, bus advertising offers exposure to local commuters, drivers and pedestrians. Thanks to traffic jams, a modern customer spend as much time, if not more, in their cars as they do watching television or reading newspapers or browsing the web. This makes Bus shelter advertising the most effective medium to reach potential clients. Bus shelter and bus advertising includes full bus wrapping service, Bus Back Panel Advertising, Bus Side Panel Advertising, Bus window advertising etc. BENEFITS OF BUS ADVERTISING: Bus advertising offers high-frequency. Bus advertising yields targeted and focused coverage. Cost of advertising on buses in India is cost effective as compare to other mode of advertising. Bus shelter advertising is extremely cost-effective media avenue. Bus advertising offers ideal synergy for radio. Bus advertising is Ideal for short-term and promotional campaigns. Buses are moving throughout residential and core business areas and on busy streets, every day. Bus advertising delivers quick bursts of essential information throughout the marketplace and is seen by both pedestrians and vehicular traffic at the same time. Bus Advertising is available in a variety of sizes and formats, ranging from side panel displays to fully wrapped buses. Cost of advertising on buses in India is cost effective as compare to other mode of advertising. Some other benefits of bus advertisements are low cost outdoor advertising with a highest possible reach. Bus shelter advertisements act as an excellent advertising technique. Bus advertising provides advertising which provides High-visibility, High-impact and High-frequency. Bus advertising offer 24-hour clear visibility and read ability provides a high-impact medium. Bus advertisements offer unlimited creative concept and flexibility. Bus shelters which is situated near shopping centres offer point of sale position. Cost of advertising on buses in India is cost effective as compare to other mode of advertising. Bus advertising offers street presence and local public reach. Bus advertising has many benefits to offer. Which will helps to fuel your business and bring more customers. Cost of advertising on buses in India is cost effective as compare to other mode of advertising. Bus advertising`s target locations are Supermarket, Primary school, High school, Seasonal and coastal regions, Upper community location. Bus shelter advertising is located along busy streets in major metropolitan cities. Benches provide excellent exposure to pedestrian and vehicular traffic. Cost of advertising on buses in India is cost effective as compare to other mode of advertising. Bus advertising is act as an effective medium for point-of-purchase, ethnic or geographic marketing. Bus advertising offers exposure to local commuters, drivers and pedestrians. It acts as an moving billboard`s, which is typically displayed on the bus exterior and come in a variety of sizes and high-impact formats to reach your audience. Bus advertising is available in various sizes and formats, from side panel displays to fully wrapped buses. Cost of advertising on buses in India is cost effective as compare to other mode of advertising. Bus advertising even can be used for target specific demographics based on route and deliver exposure where other out-of-home advertising may be prohibited. Bus shelter are strategically located along busy streets in major metropolitan cities, Bus advertising provide excellent exposure to pedestrian and vehicular traffic. Bus advertising give consumers something to look at while they’re waiting for the bus, making them particularly effective for advertising point-of-purchase and directional information. Cost of advertising on buses in India is cost effective as compare to other mode of advertising. There are different types of Bus advertising, which are: Bus shelter advertisement has an option of either illuminated or non-illuminated advertisements as per the need and budget. Bus advertising is suitable where large formats are prohibited. It proves highly cost - effective. Bus advertising offers wide area coverage. Bus advertising is cost effective. Bus shelter advertising available in two varieties: non-illuminated bus shelter and illuminated bus shelter. Bus advertising is offer eye level visibility. Cost of advertising on buses in India is cost effective as compare to other mode of advertising. Bus advertising is eye catching and easy to read. Bus advertising has Excellent Reach ability. Cost of advertising on buses in India is cost effective as compare to other mode of advertising. Bus shelter advertising is suitable for metropolitan and affluent residential localities, Bus shelter advertising stands out prominently. Bus advertising in India is effective mode of advertising, Due to the great visibility and low public bus ads costs to advertise on buses. The definition of Bus advertising in India is advertising displays placed inside and outside of city buses, which include partial and full wraps. City Bus handles advertising and ad on bus options is available in almost every market across India. Bus shelter ad also called as bus station advertising or bus stand advertising, it is the least costly of all researched media formats. Bus stop advertising helps to reach drivers and pedestrians in a cost-effective way. Bus stop ads are available in almost each city across the country and are a great supplement to almost any other format. Statistics show that posting an advertisement on bus displays on the outside and inside of city buses or on bus shelter advertising displays produces high impressions at a low cost. Similarly, double decker Bus advertising in India is a great way to increase exposure of an ad campaign using sightseeing tour Bus advertising in India. Bus advertising in India is a great medium of visibility for your brand. It is a cost effective medium to promote your brand and spread awareness. Bus stop advertising in India where every metro-semi metro- urban city has the huge number of buses, in urban area people are depend on the city buses for their daily transportation. Buses circulating in the busiest areas of major metropolitan cities, Bus advertising in India offers exposure to local commuters, drivers and pedestrians. Thanks to traffic jams, a modern customer spend as much time, if not more, in their cars as they do watching television or reading newspapers or browsing the web. 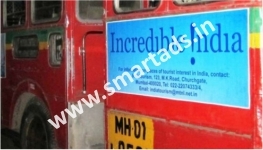 This makes Bus advertising in India the most effective medium to reach potential clients. Bus shelter and Bus advertising in India includes full bus wrapping service, Bus Back Panel Advertising, Bus Side Panel Advertising, Bus window advertising etc. BENEFITS OF BUS ADVERTISING IN INDIA: Bus advertising in India offers high-frequency. Bus advertising in India yields targeted and focused coverage. Bus advertising in India are extremely cost-effective media avenue. Bus handles advertising offer ideal synergy for radio. 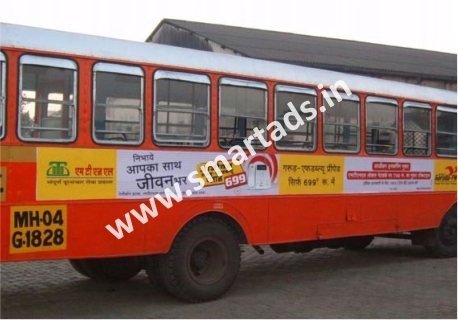 Bus advertising in India is Ideal for short-term and promotional campaigns. Buses are moving throughout residential and core business areas and on busy streets, every day. Bus handles advertising deliver quick bursts of essential information throughout the marketplace and is seen by both pedestrians and vehicular traffic at the same time. Bus advertising in India is available in a variety of sizes and formats, ranging from side panel displays to fully wrapped buses. 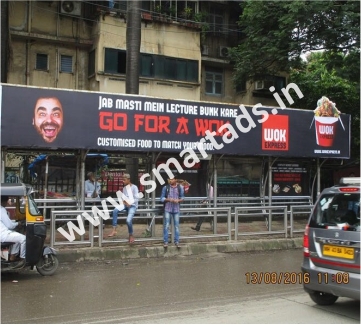 Some other benefits of Bus advertising in India are low cost outdoor advertising with a highest possible reach. Bus advertising in India act as an excellent advertising technique. 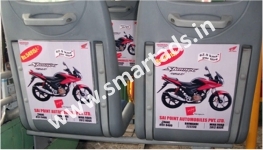 Bus advertising in India provides advertising which provides High-visibility, High-impact and High-frequency. Bus advertising in India offer 24-hour clear visibility and read ability provides a high-impact medium. Bus advertising in India offer unlimited creative concept and flexibility. Bus shelters which is situated near shopping centres offer point of sale position. Bus advertising in India offers street presence and local public reach. Bus advertising in India has many benefits to offer. Which will helps to fuel your business and bring more customers. Bus shelter advertising`s target locations are Supermarket, Primary school, High school, Seasonal and coastal regions, Upper community location. Bus shelter advertising is located along busy streets in major metropolitan cities. Benches provide excellent exposure to pedestrian and vehicular traffic. Bus advertising in India is act as an effective medium for point-of-purchase, ethnic or geographic marketing. Bus handles advertising offer exposure to local commuters, drivers and pedestrians. It acts as an moving billboard`s, which is typically displayed on the bus exterior and come in a variety of sizes and high-impact formats to reach your audience. Bus advertising in India is available in various sizes and formats, from side panel displays to fully wrapped buses. Bus advertising in India even can be used for target specific demographics based on route and deliver exposure where other out-of-home advertising may be prohibited. Bus shelter are strategically located along busy streets in major metropolitan cities, Bus advertising in India provide excellent exposure to pedestrian and vehicular traffic. Bus Shelters advertising give consumers something to look at while they’re waiting for the bus, making them particularly effective for advertising point-of-purchase and directional information. There are different types of Bus advertising in India, which are: Bus shelter advertisement has an option of either illuminated or non-illuminated advertisements as per the need and budget. Bus advertising in India is suitable where large formats are prohibited. It proves highly cost - effective. Bus handles advertising offer wide area coverage. Bus advertising in India is cost effective. Bus handles advertising available in two varieties: non-illuminated bus shelter and illuminated bus shelter. Bus advertising in India are offer eye level visibility. Bus advertising in India is eye catching and easy to read. Bus advertising in India has Excellent Reach ability. Bus advertising in India is suitable for metropolitan and affluent residential localities; Bus advertising in India stands out prominently. Advertising on Buses in Mumbai. Advertising on Buses in Delhi. Advertising on Buses in Kolkata. Advertising on Buses in Bangalore. Advertising on Buses in Ahemdabad. Advertising on Buses in Surat. Advertising on Buses in Pune. Cost of Advertising on Buses in India in Mumbai. Cost of Advertising on Buses in India in Delhi. Cost of Advertising on Buses in India in Kolkata. Cost of Advertising on Buses in India in Bangalore. Cost of Advertising on Buses in India in Ahemdabad. Cost of Advertising on Buses in India in Surat. Cost of Advertising on Buses in India in Pune.